There will be a showing this Saturday night on April 14 at 9:30 PM, of HANDS TO THE SKY at Dixon Place, NYC’s Laboratory for Performance. Tickets are $15 in advance, $20 at the door. For those of you who enjoy the Sundae Sermon parties with DJ Stormin’ Norman and a variety of guest DJ’s, you will definitely enjoy this film. My House Rocs presents Hands to The Sky. Domingo Canate – Executive Producer; Angelo Boyke – Director/Editor; JP Noel – Co-Director/Producer; Wendy Arimah – Literary Supervisor/Associate Producer; Kervyn Mark – Music Supervisor/Co-Producer. 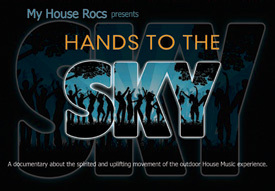 Hands to The Sky is documentary that focuses on the House Music outdoor movement. It removes the dance experience from the confines of the box and plants it in the park, lays it on the beach and sets it in unexpected and exciting places. The adroit camera crew captures the passionate connection between the dancers and the DJ’s, as they explore the themes of love and unity that emanates from the speakers. It calls souls to a common heartbeat and reveals a mystical, musical revolution on the strength of radical peace and a powerful reflection of freedom. For more information about Harlem please also see www.HarlemTrends.com.